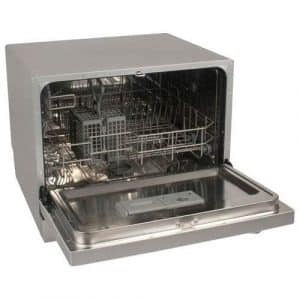 Portable dishwashers offer many advantages over the standard variety. 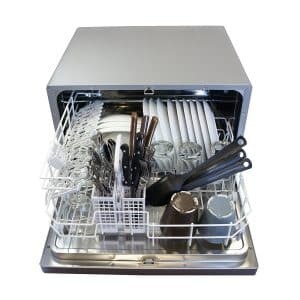 A portable dishwasher does not require any special installation, and it can easily hook up to the sink, as well as be carried along, if you are moving to a new place. In order to be able to make the best portable dishwasher purchase decision, we have put this top 10 list together. First is a list of the features you should look out for, then there is a list of the top 10 dishwashers in 2019. Weighing just 44 lb, this Costway dishwasher offers 6 cycles, including rinse, speed, ECO, glass, normal and heavy. It is controlled electronically, and each wash session can be delayed in 1-hour increments, up to 24 hours. There is an easy-to-read LED display, an easy-to-clean filter, and a quick-connect kit for an easy install. This dishwasher also includes a rinse aid and detergent dispenser, and it measures 21.5 x 19.5 x 17 inches. 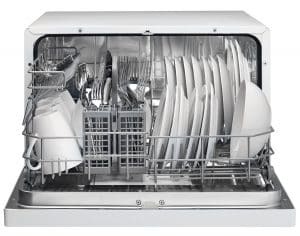 This Energy Star compliant dishwasher features a low water consumption of just 3 gallons (11.7 liters) per wash. It offers a 6 place setting capacity, and 6 wash cycles, including glass, soak, economy, normal and intensive. Electronic controls and an LED display make it easy to operate and manage. Installation is quick and easy, as it is compatible with the majority of kitchen faucets. It is only 52dB loud during operation, and has a delay-start option for 2, 4, 6 or 8 hours delay. This dishwasher measures 21.6 x 19.7 x 17.2 inches (55 x 50 x 43.8 cm) in dimensions, and is backed by a 12-month manufacturer’s warranty. Most portable dishwashers are small-sized, but this one from General Electric, is different. 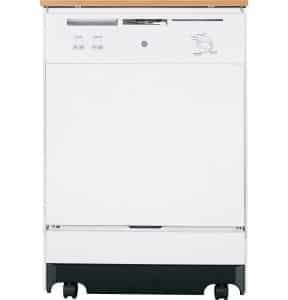 The GSC3500DWW is a full-console dishwasher on wheels. It is 36 inches high and 24 across. It weighs 147 lb, and is 27 inches deep. Extras include a decorative wood laminate top, a hard food disposer, electronic controls, rinse aid indicator, a steel door, and a QuietPower motor, which generates just 64 dBA. There are 12 place settings, and 5 wash cycles, which include normal, heavy, rinse only, plate warmer and pots & pans. General Electric further supports this dishwasher with a 1-year warranty. Featuring 6 wash cycles, this dishwasher also features a 6 place setting with space for dishes up to 10.5 inches in width. It comes with a quick-installation kit, which contains a faucet adapter and a five-foot hose, making installation a snap. The PDW60EB is 17 inches high and 21 across. It will fit under most kitchen cabinets, uses an average of 3.8 gallons per wash, and has stainless steel interior parts. Koldfront guarantees it for one year. EdgeStar’s DWP61ES features a delay-start and a child-lock function. Controlled by a digital system, it consumes 61% less energy than other similar models. There are 6 place settings and 6 wash cycles including light, normal, heavy, rinse, glass and soak. It includes a cutlery tray, is 55dB loud, and has stainless steel interior parts. This machine is 17 inches high and 21 wide, and EdgeStar backs it with a 1-year warranty. 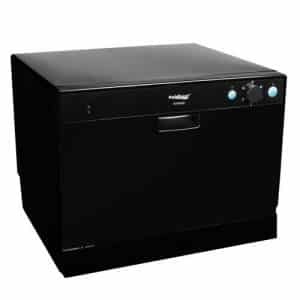 The SD-2202S from SPT is a silver-colored countertop dishwasher, with a stainless steel interior. It features a delay-start function up to 8 hours, 6 standard place settings, and a faucet adapter for a quick install. There are 6 wash programs including light, normal, heavy, speed, glass and soak. Also included in the package is a silverware basket and a dish rack. Water consumption is 3.8 gallons per sessions, while noise level is 55dB. 6 wash cycles including soak, speed, heavy e.t.c. 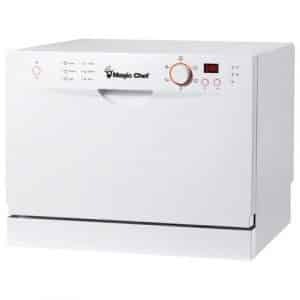 With 6 place settings, 5 programs, and a stainless steel interior, Magic Chef offers this good quality and reliable dishwasher. It uses just 680 Watts of electricity, includes a cup rack and cutlery basket, and also features an automatic rinse aid and detergent dispenser. The package includes a quick-setup kit, which makes installation a snap. It is 17.2 inches high, 21 inches wide, and it weighs 49.5 lb. This SPT dishwasher is designed for the countertop. With a height of 17.2 inches, and a width of 21, it will easily fit under most cabinets. It offers 7 wash programs, including light, normal, heavy, rinse, mini-party, speed and soak. The operation can be delayed for 2, 4, 6 or 8 hours, and indicators alert you of a rinse aid refill or a closed faucet. The package includes a quick-connect system, with a universal faucet adapter, for quick and easy installation. This dishwasher uses just 3.2 gallons (12 liters) per normal cycle, and it offers a 6 place setting capacity. With a 17.2 inch (44 cm) height, it will easily fit beneath most kitchen cabinets. It weighs just 26 kg (58 lb), which makes it easy to be carried around. There is a stainless steel interior for durability, an LED display, electronic controls, and a quick-connect kit for a quick installation. Also helpful, is an automatic detergent and rinse agent dispenser, plus Danby backs this machine with a 1-year warranty. 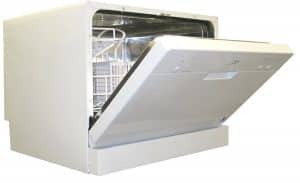 In addition to having a stainless steel interior, this dishwasher’s spray arm is also made from stainless steel, guaranteeing a highly durable machine. The are 6 wash cycles, including light, normal, heavy, soak and speed. 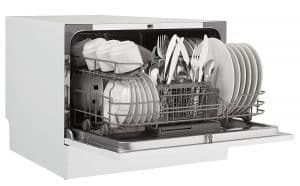 Detergent and rinse agent are automatically dispensed, and the dishwasher has a 6 place settings capacity. The entire machine measures 17(H) X 21(W) X 20(D) inches. The package includes a silverware basket, plus a dish rack, and a faucet adapter to make installation quick and simple. 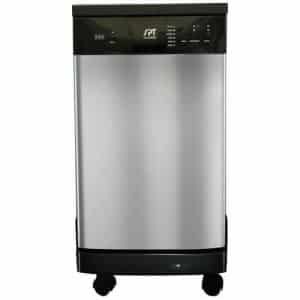 For its user-friendliness, price, reliability and durability, this machine holds the first position as the best portable dishwasher in 2019. Size & Capacity: Portable dishwashers are usually smaller than standard-sized ones, but they can either be designed for the countertop or with wheels. It’s therefore necessary, that you first decide on where you will position the dishwasher. This also includes the size of the machine, and how much items you can wash at once. 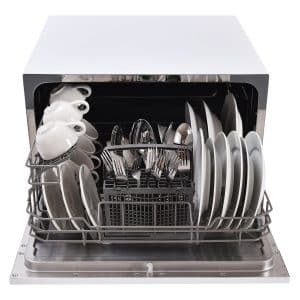 Most portable dishwashers accept about 5 or 6 place settings. Noise Level: Noise level can be a concern for some people. In such a situation, you will have to pay attention to the decibel rating of the dishwasher. A 45 to 50-decibel rating is a very silent machine, and even those less than 55 decibels, are still quite good. Tub Material: Interior tub material can determine a dishwasher’s durability to a large extent. Stainless steel tubs will last longer than plastic ones. This is worth paying attention to, if durability is important to you. On the other hand, lower pricing could make plastic tubs attractive. Extras: These include the number of cycles the dishwasher has. If the water draining out from the dishwasher needs to go above the dishwasher’s level, then you will need a dishwasher with a water pump. Extras can also include sensors for temperature, or wheels for more convenient movements. We have come to the end of this 2019 top 10 portable dishwashers review, and the turn is now yours to make a choice. Feel free choosing any of these 10 wonderful machines, but if you need our help in making a selection, then our recommendation is the SPT SD-2201W in position #1.